At work at an ACC show. After a career in national health policy, Thea (Teddi) Fine returned some years ago to her first love: creating jewelry with tiny glass beads, a needle and thread in a process known as bead weaving. She first learned to work with beads as a child, taught by her maternal grandmother, Rose, a Renaissance woman who never met a craft she didn’t love. While beading is often exacting and methodical, Thea finds “playing with beads” wonderfully freeing and artistically satisfying. Each piece of what she calls “wearable bead art” is artist-sewn, one grain-of-sand-size glass bead at a time. Beads of varying color may be paired with crystal, semiprecious stones or found objects to create the optimal palette of hues, textures and finishes to bring a design idea to life. Then, the Zen of bead weaving begins. Thea hand sews the beads and other objects together, often using stitches with roots in ancient times and far-away lands. The chosen stitches and desired vision dictate the ultimate look. The beads may march along in organized lines and geometric forms, or they may wander in a freewheeling, freeform manner. In either case, the end product is a magical melding of color and texture. A tiny “signature” - a single purple bead - is hidden in each piece. But don’t look for it. Often, it is tucked away inside, hidden, but we know it’s there! Her work ranges from necklaces and earbobs to bracelets and brooches, and includes a growing assortment of Judaica: mezuzahs, yarmulkes dreidels and other items. Each is created with an eye toward the elegant, the unusual, and, on occasion, the quirky. Many are one-of-a-kind pieces; others are replicable, limited editions. Still other pieces have been commissioned by customers, including some that were remade, revived and restyled from old, tired or broken jewelry. At its core, the work is all about threading a needle and connecting an ancient craft with a contemporary art form. For Thea, it’s also a connection of the heart across the generations. Thea is a member of the American Craft Council (ACC), the Baltimore Bead Society and is also a state-juried “master artisan” of the Pennsylvania Guild of Craftsmen (PGC). 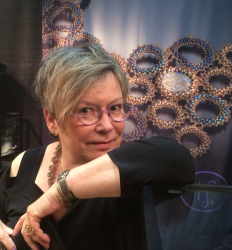 In 2018 alone, her work has been seen at the Smithsonian Craft Show, the Philadelphia Museum Craft Show, the American Craft Council show in Baltimore, and Paradise City in Northampton, MA. . Previously, she displayed and sold her work at PGC shows, at the ACC's Baltimore show for the past five years (and its Atlanta show), at the Guild of Artists and Artisans in Ann Arbor, MI, and at the Craft+Design show in Richmond, VA.. Her work is owned by patrons in not only in Baltimore and elsewhere around the US, but also in South Africa, Australia and Israel. You may even spot it on the local news from time to time. Her work is available through a few select galleries and her online website. Thea also teaches the art of bead weaving and has charted some of her designs and developed kits for the intrepid bead weaver to try on his or her own.